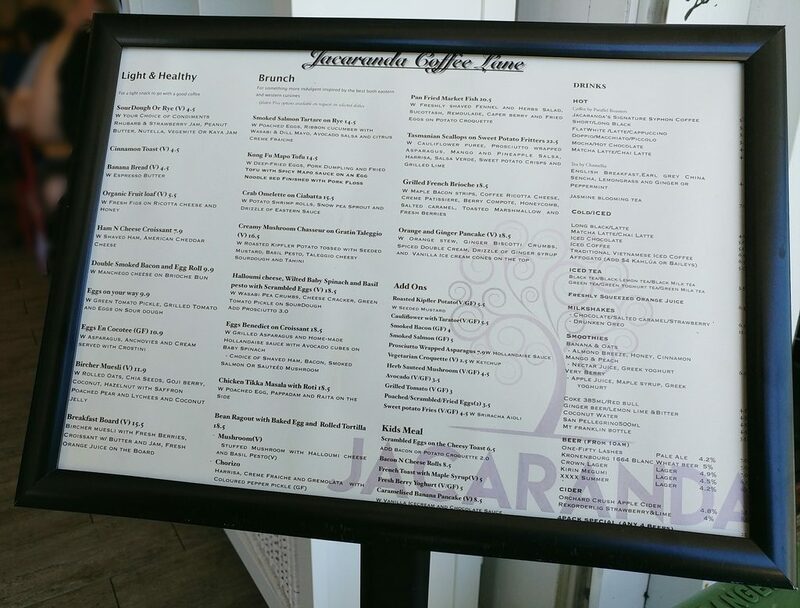 Jacaranda Coffee Lane appeared on a list of interesting breakfasts, which is a sure way to pique our interest. Located along the busy section of West End’s Boundary Street, it has an understated entrance, and we have probably walked past it in the past without even noticing. There is a menu on a stand near the entrance, but in simple black and white small print, it too doesn’t grab attention. If you look up, you’ll see the eatery sign. We had headed there with intent though, so didn’t pass by. We stepped across the threshold, into a long, relatively narrow space. It was wide enough for bench seats and tables along one side, and tables fitting two to four on the other side. The service counter was at the far end of the corridor, and the kitchen hidden away behind that. The menu on a stand outside. We were greeted by the one waitstaff on, bustling on their way to deliver food to a table. 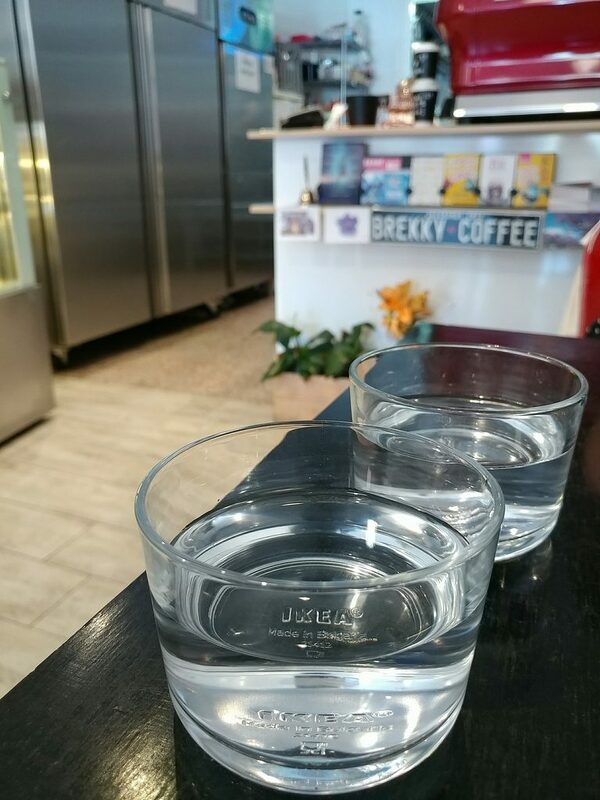 They returned to efficiently clean down a table, seat us, and bring out a bottle of water and squat tumblers, like Lune had. 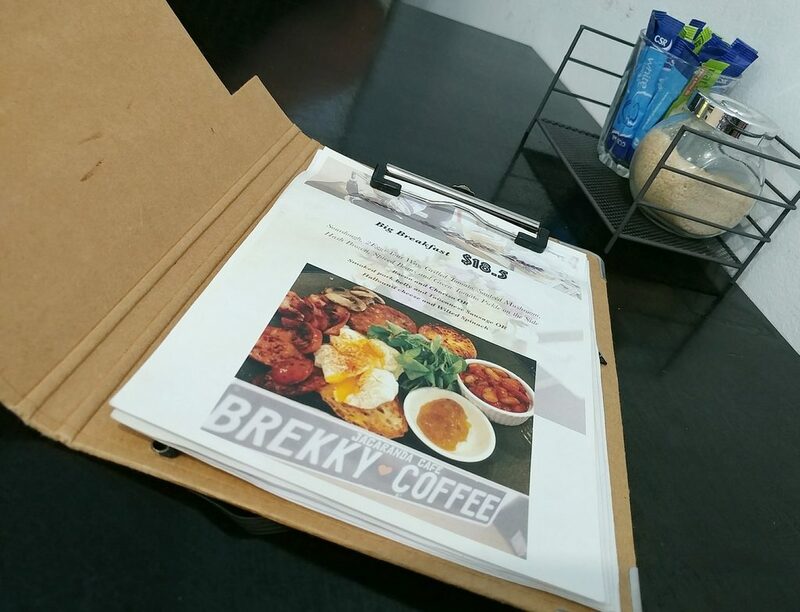 Menus were also brought out, pages listing available dishes in little cardboard folders. The stylish, short glasses (which are apparently from Ikea) and the front of the service counter. 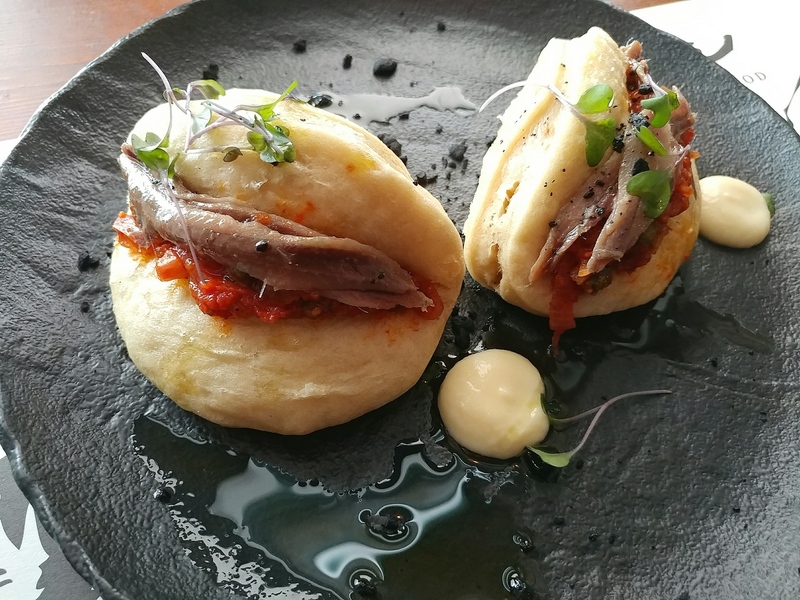 Among those pages were Asian-influenced items like the Matcha pancake with Yuzu custard, and Crab omelette on ciabatta bread with potato shrimp rolls. There were also other more European items like the Grilled French brioche with Maple bacon and coffee ricotta cheese, and Eggs Benedict on a croissant (accompanied by other items). We eventually decided on our food and coffees, and placed orders for both. 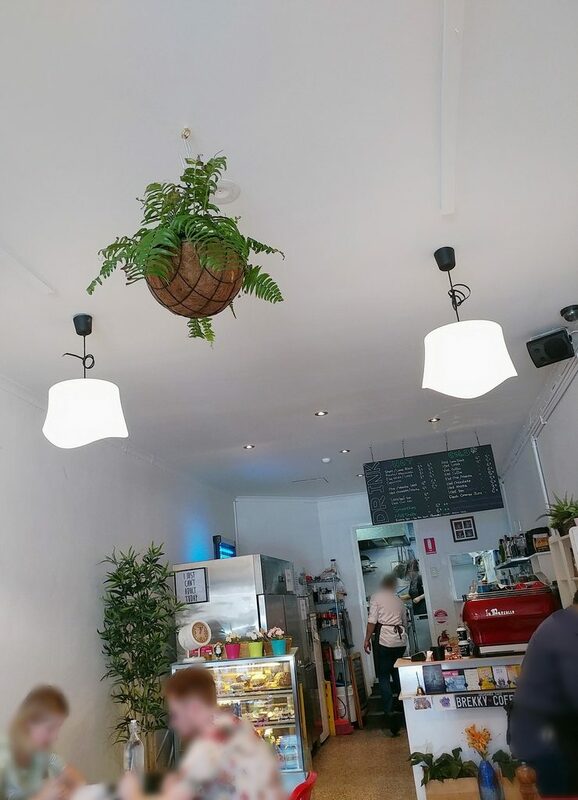 Looking more around the space, it was casually decorated rather than styled to the hilt like many other new cafes, though there was a nod to current looks. There were white walls and wood look floor tiles, a few shelves on one of the walls with nick nacks and little pots of fake plants, and a few small framed paintings on the other wall. Keeping the colour palette simple, and perhaps dating it a little, the tables had black laminated wood tops, and were matched with metal chairs painted red. It was air conditioned to a pleasant temperature, just a bit cooler than the summer warmth outside. Instrumental piano music played in the background, reminding us of hotel lobby music, silence-filling and innocuous. The space tended to trap patron voices and let traffic noise from Boundary Street in though, as it just bounced from wall to wall. 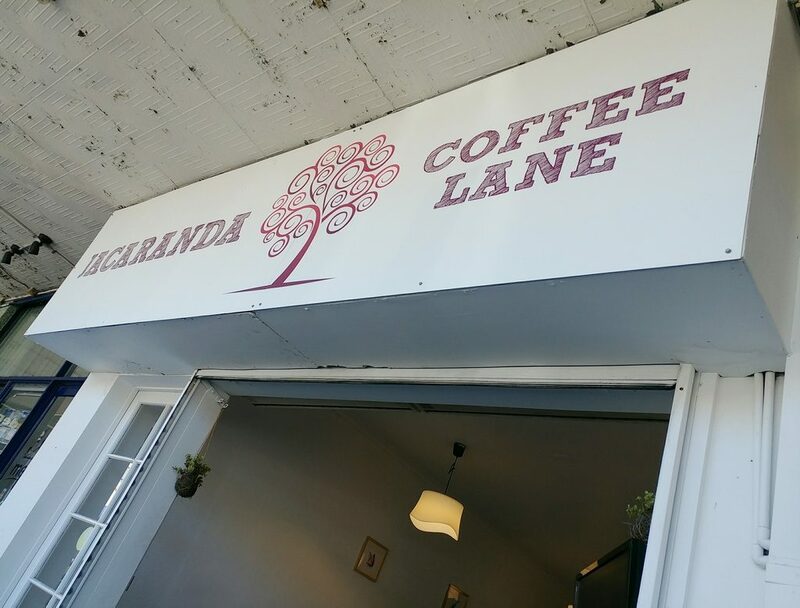 The interior of Jacaranda Coffee Lane (some of it). When the soy iced latte came out, it was..a latte with ice in it. It was a change from what was expected, but not bad. The milk foam had a lovely, airy but dense texture with a good microfoam. 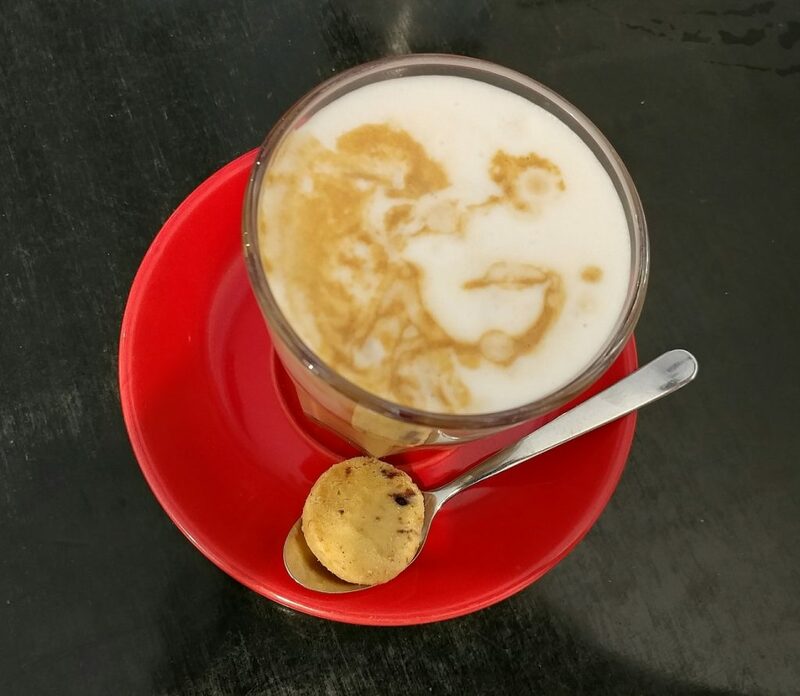 It didn’t have latte art on the surface, unless you count abstract art. Still, taste takes precedence over appearance, and it was found to be a good flavoured coffee, with chocolatey, roasted notes, and a hint of almost bitterness that didn’t quite cross the line. Cleverly, it had coffee ice cubes in it to keep it from becoming too dilute as the ice melted. 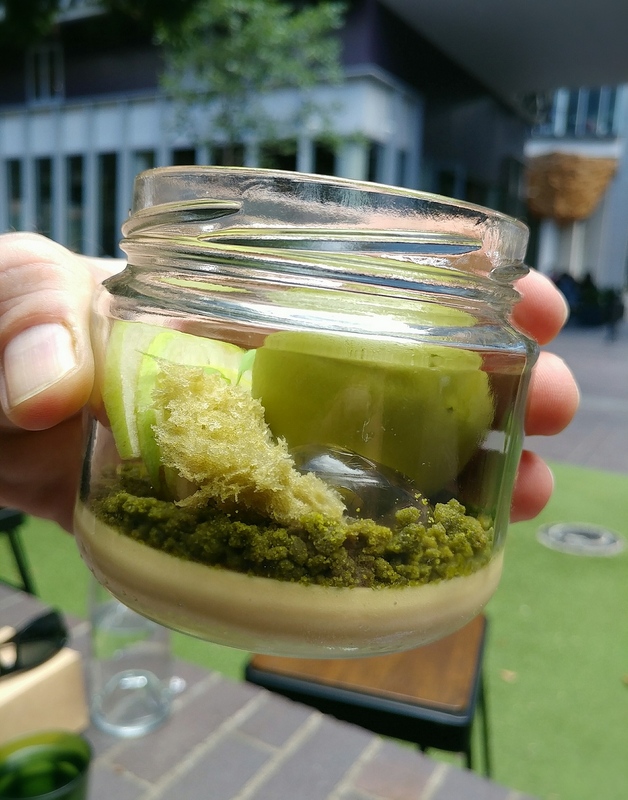 We were initially wondering how it would turn out, as when stirred, one could tell that there was a significant amount of ice in the glass. That was a nice touch, and showed thoughtfulness. 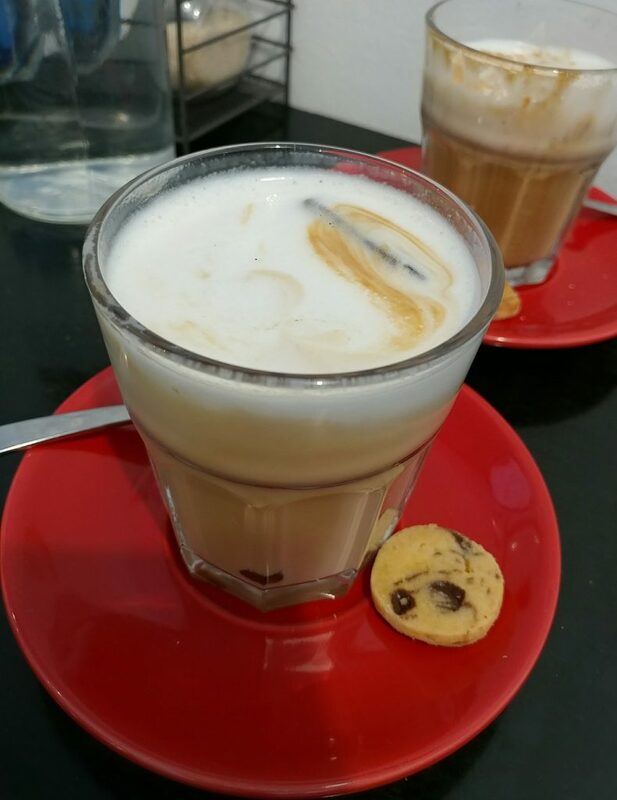 The coffee also came with a chocolate chip cookie that was buttery and had a biscotti-like hard crunch. 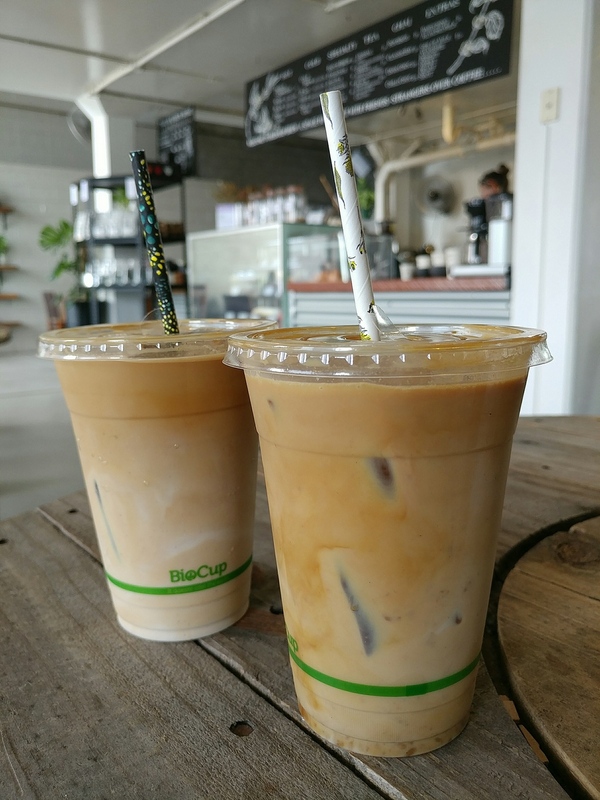 The iced latte was so good that the one of us who had ordered a flat white changed their order to another iced latte. 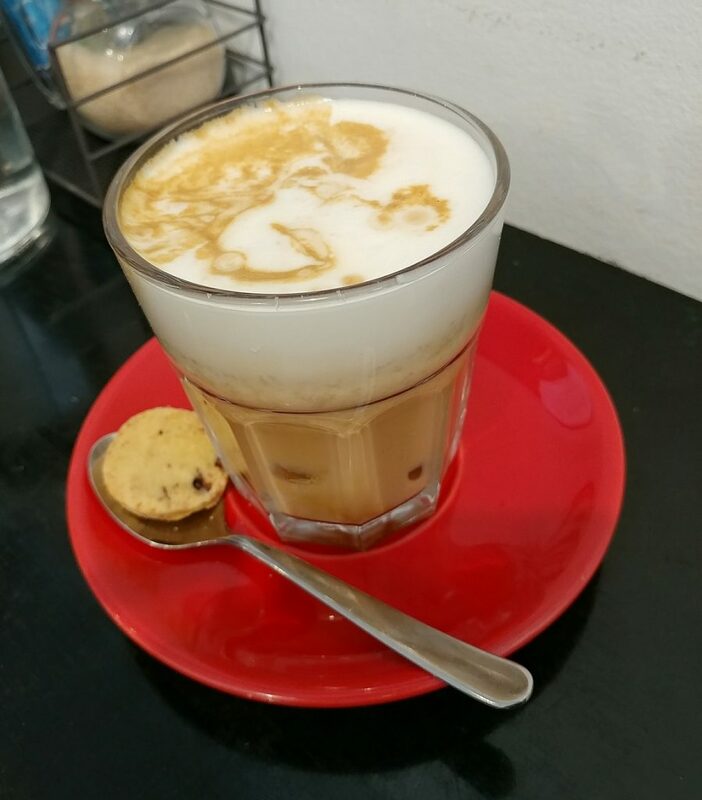 The soy iced latte, with biscuit. Making it two iced lattes..even if even less arty. 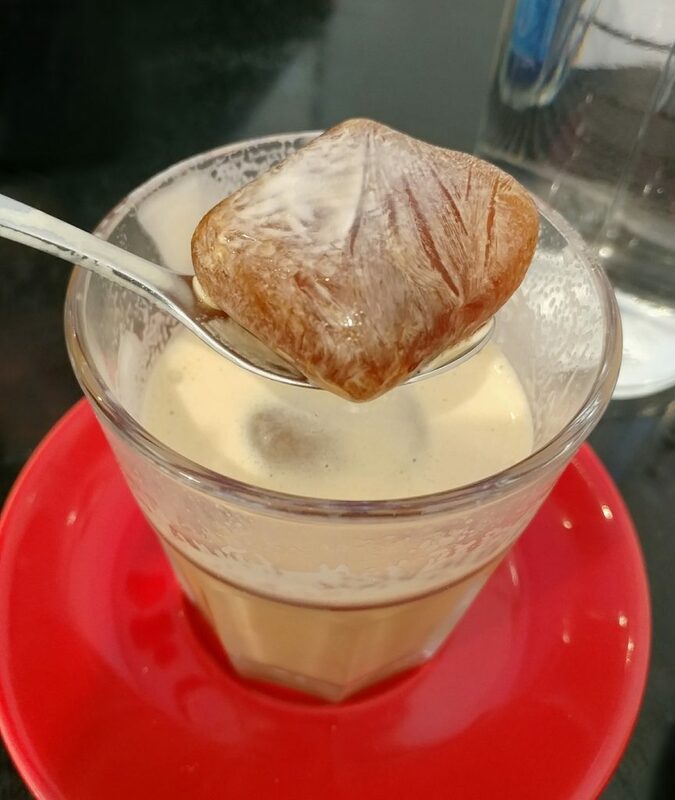 The coffee ice cube, a nice touch. The dishes were brought out together not too long later. 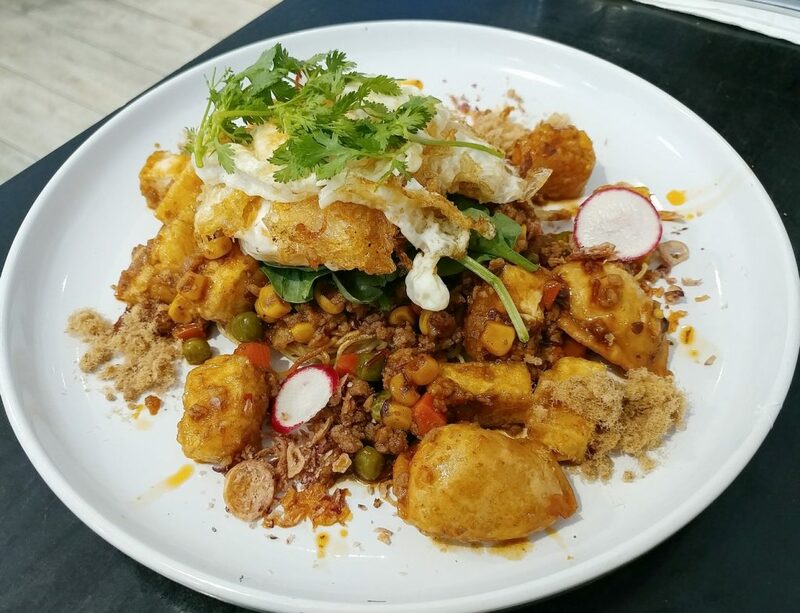 The Kung Fu Mapo Tofu was listed in the menu as having deep fried egg, pork dumpling, and fried tofu with spicy mapo sauce on an egg noodle bed, finished with pork floss. It arrived as a golden brown heap. 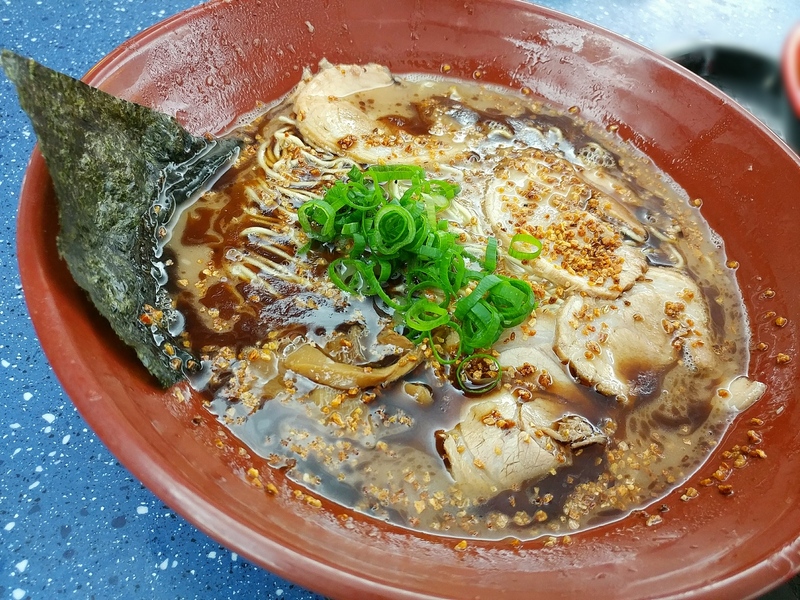 Quite characteristically, asian food, while delicious, often tends to not translate well in photos, as the scrumptious sauces make everything varying shades of brown. The fried eggs at the top of the heap had runny yolks and crispy edges. The egg white were still bouncy rather than being too tough. 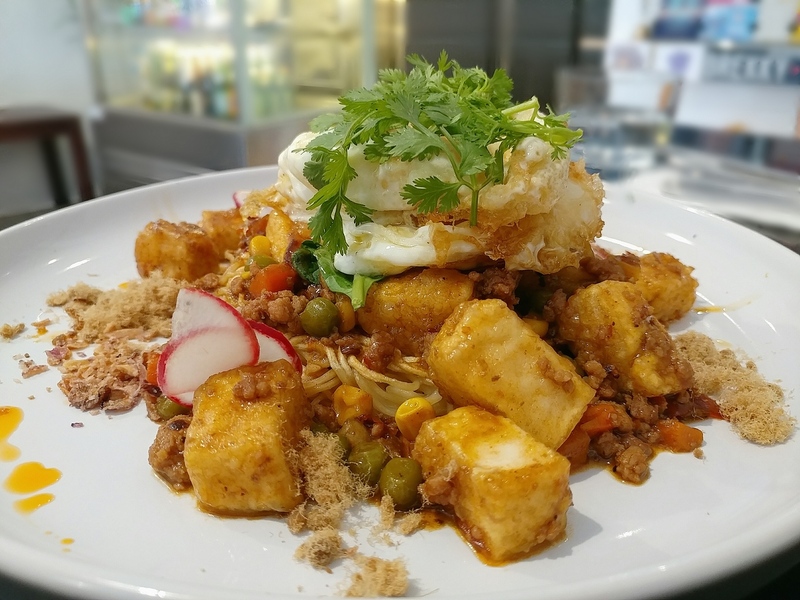 The fried mapo tofu cuboids did have crunch at the corners, if not all the way through. The egg noodles making the base of the dish were a woven nest, crunchy at the edges of it as well. The minced meat and sauce mix melding everything together was sweet, salty, and spicy, and packed a bit of heat. There was some additional sweetness from the pork floss. The fried pork dumplings might still have had crunchy pastry if we had found them sooner, but they were camouflaged amidst the other ingredients, and looked like the tofu. 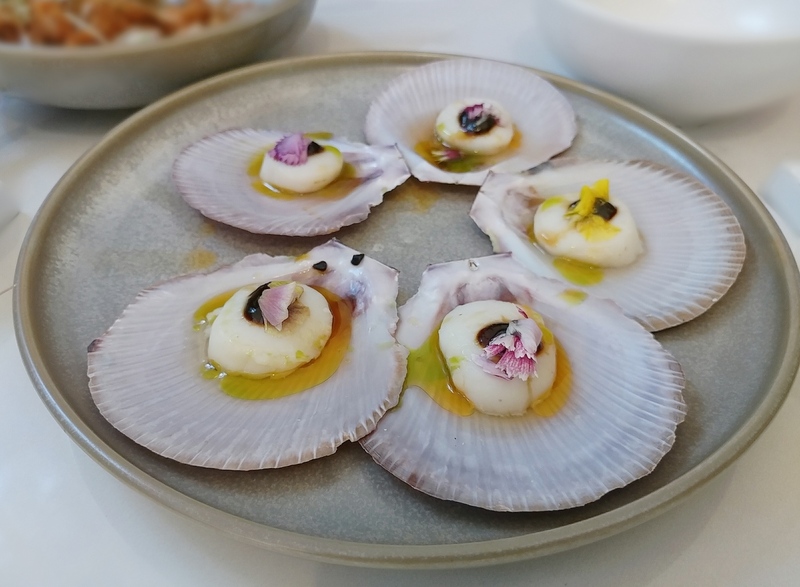 It was a dish with quite a few components that, while seeming a bit of a hodgepodge initially, actually worked well, and had a pleasant variety of textures. 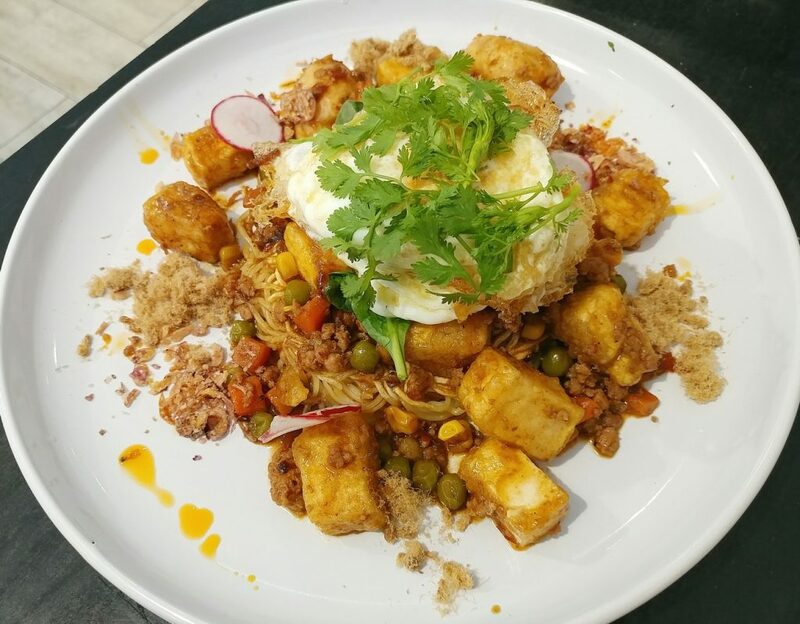 The Kung Fu Mapo Tofu dish, with fried egg, fried tofu, spicy mapo sauce, egg noodles, fried pork dumplings, and pork floss. The Kung Fu Mapo Tofu dish closer up. 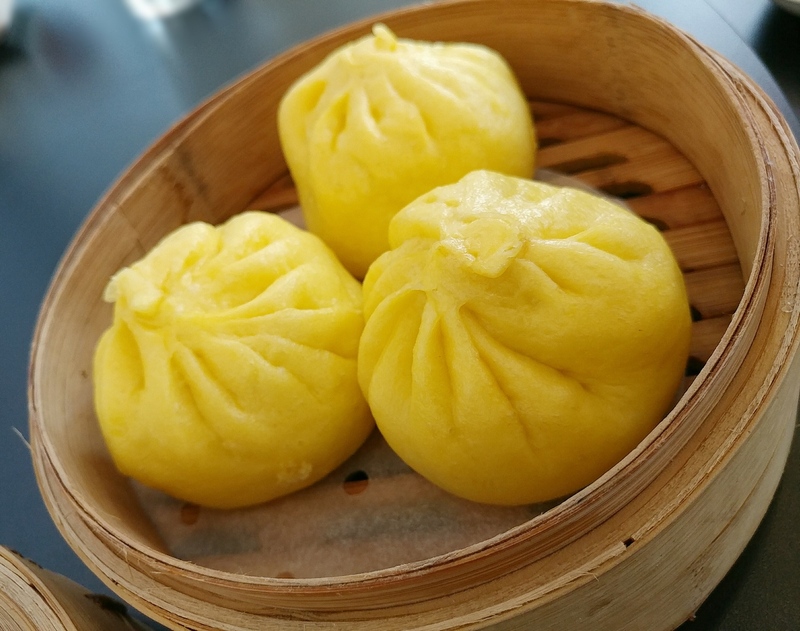 That’s a pork dumpling right in front. A bit more detail of the dish. Mapo tofu blocks everywhere. The egg yolk was indeed runny. 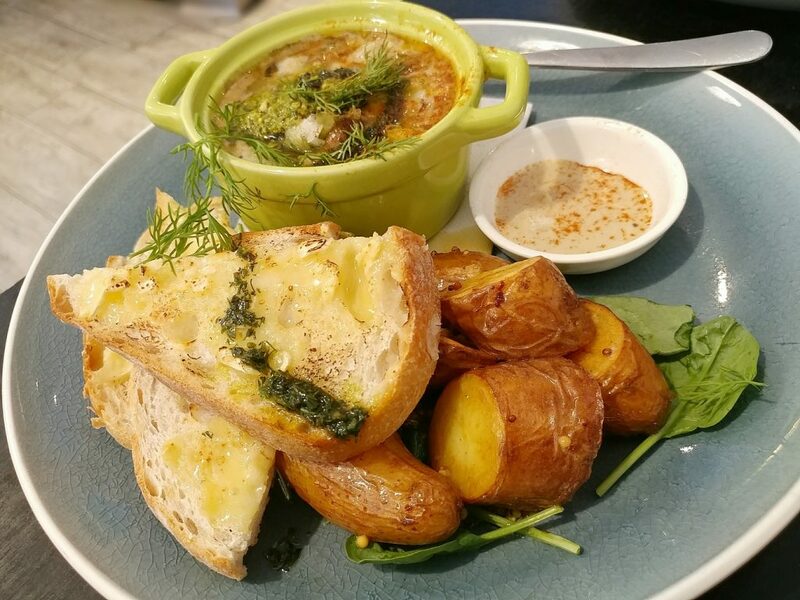 We also ordered the Champignons chasseur on gratin Taleggio, with creamy mushrooms, roasted Kipfler potatoes tossed with seeded mustard, basil pesto, Taleggio cheesy sourdough, and tahini on the side. 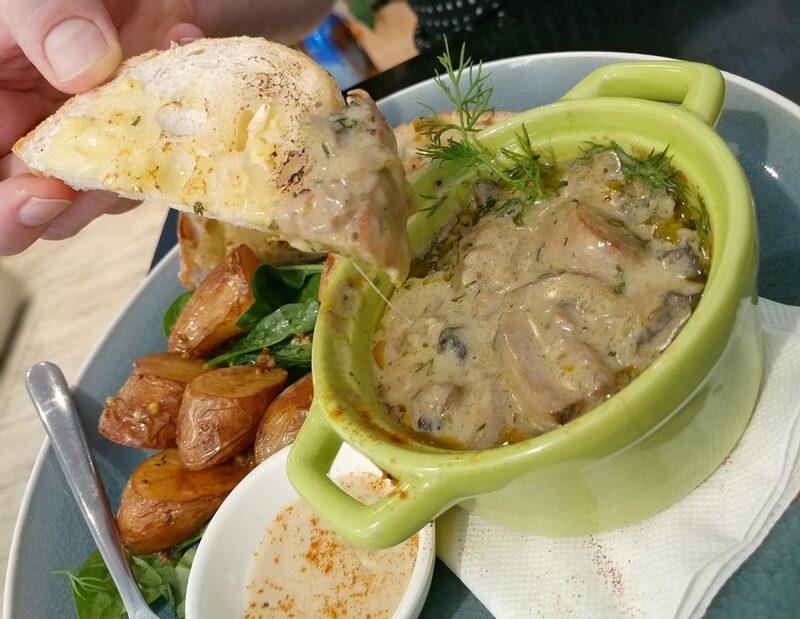 The thymey, cheesy, creamy mushroom mix was served hot in the ramekin, just seasoned enough, and not too salty. The toasted sourdough had Taleggio melted over it, and while not overflowing, there was enough there to deliver creaminess and the nutty flavour. 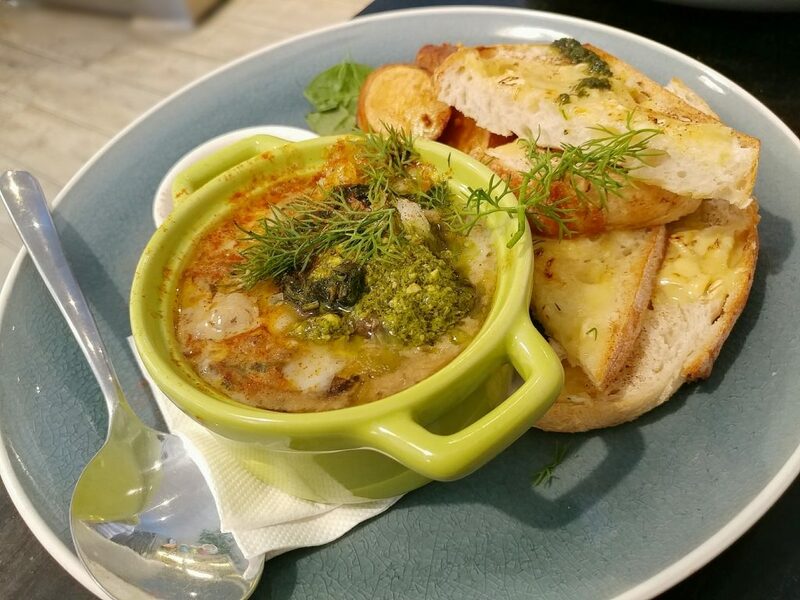 Mushrooms, cheese, and thyme are a classic combination, and the browned and crunchy edges of the toasted bread were a great foil for the soft and gooey chasseur. Just those on their own would have been satisfying enough. The potatoes had crispy thin skins, and were powdery on the inside. They needed a bit of salt for seasoning, which waitstaff brought over when we asked. The tahini had a rich sesame seed flavour, but didn’t really go with the rest of the components of the dish. 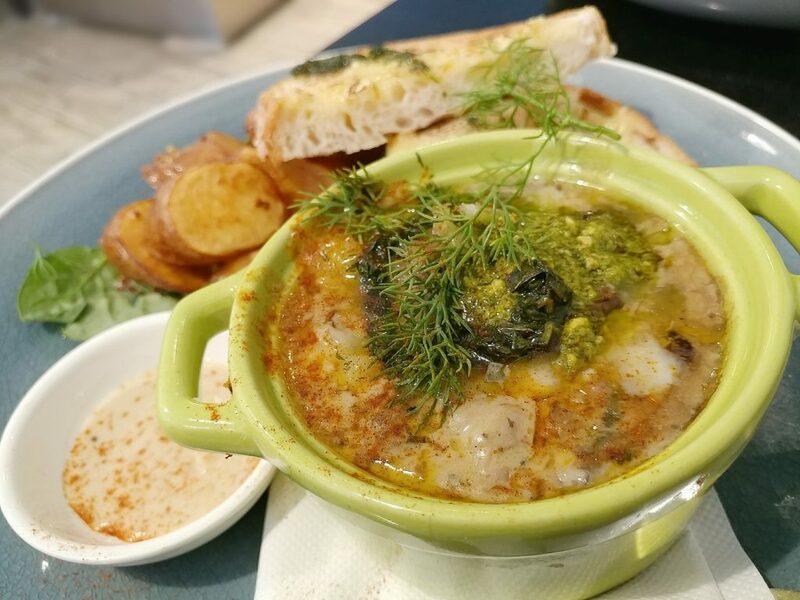 The Champignons Chasseur on gratin Taleggio, mushroom mix, Taleggio cheesy sourdough, roasted Kipfler potatoes, basil pesto, and tahini. The dish from another angle, showing the sourdough with Taleggio and roasted potatoes better. That tasty mushroom chasseur mix closer up. That’s how you eat it. Or one way to eat it. 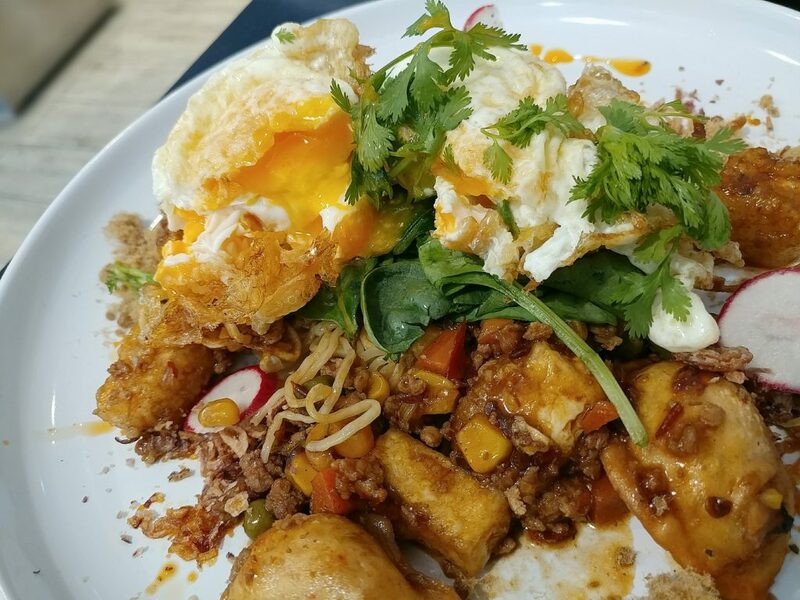 Jacaranda Coffee Lane is a hiding-in-plain-sight good brunch destination. There was good flavour and texture variance within each dish, and, importantly, the food was tasty. They also delivered on the coffee, despite it not being what we had initially expected. Waitstaff, though busy, were cheerful and friendly. It is worth stopping by. 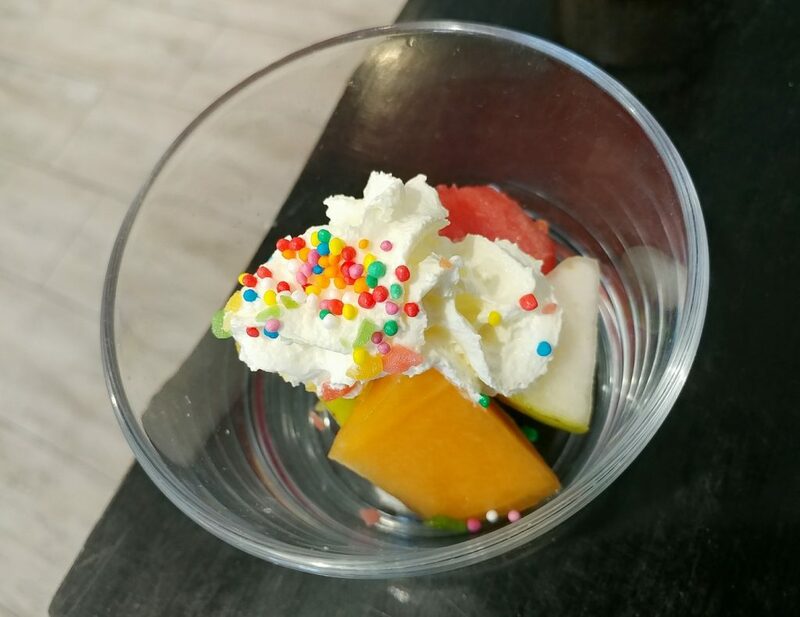 We happened to be there on the weekend of the first year anniversary of their opening, and everyone received a complimentary little dish of fruits, cream, sprinkles, and popping candy. Price point: $14.50 to $22.50 for brunch items. Value: Good, for what you get.